"Rufus, the author of numerous books, including Party of One: The Loners' Manifesto, and an accomplished journalist whose credentials include the BBC, the Los Angeles Times, and the Boston Globe, is a distinctive tour guide for a journey everyone has contemplated-death. 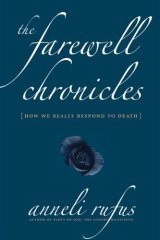 In contrast to Elisabeth Kubler-Ross's classic On Death and Dying, Rufus describes the response to death in personal scenarios rather than universal stages of grief. In one vivid example, she portrays her own reaction and that of her college friends when an unpopular girl from their dormitory simply drops dead one evening. Despite, or perhaps because, they tormented the girl when she was alive, they cry hysterically on the way home from the memorial service. Grief -- or is it guilt? -- manifests itself in this instance. With wry humor and brutal candor couched in gorgeous prose, Rufus depicts perverse responses to death as well as the more conventional trappings and expressions of grief. This wise and forthright book is recommended for large public and university libraries." "After telling the disturbing story of a girl who was made a laughingstock by her dorm mates, then, one day, dropped dead in the library, Rufus writes: 'When you torment others while they are alive, the last thing you imagine is that they might die before you can ask them for forgiveness.' The girls who had teased her most cried the loudest over her demise, Rufus relates. Our feelings when someone dies, Rufus says, are not always pretty and don't always seem appropriate to others: apathy, guilt, greed, disgust, relief and foreboding. Rufus, a journalist, recounts numerous examples from her own life and the lives of others in order to explore these complex reactions to death: her apathy as a child when her emotionally remote grandmother died ('There goes our vacation,' she thought); a friend's desire to get the best of her mother's possessions before her mother underwent a hysterectomy. This isn't a self-help book, but many readers will respond to, and identify with, Rufus's frank, sometimes startling, sometimes acerbic narratives." And so, through meditations and reminiscences about herself, her family, her friends, how she felt and how she caught them feeling, Rufus examines those distressing, 'messy' feelings we are expected to have, and often do have, like 'regret' and 'guilt,' 'isolation,' 'horror,' when faced with the death of someone we know and love, or are supposed to love - but also embarrassing, mean, self-serving feelings, like 'greed' and 'apathy' and 'relief,' even 'rejoicing,' whose presence startle and shame us. Working past the hypocrisies, false comforts and brittle silences that often obscure our reactions to death, she describes her feelings as she has found them in herself and displayed by others, with penetrating compassion, in sometimes bruising, honest detail, with courage and, often, with grace. Her tone, conversational, sometimes intimate, often displays a winning naturalness, occasional eloquence and a style of humor that must be called deadpan. Some books have the value of a slap in the face. The hand may not be the steadiest, the aim may not be perfect. But we waken."